Home » Spelling Dictionary » How Do You Spell Bought? 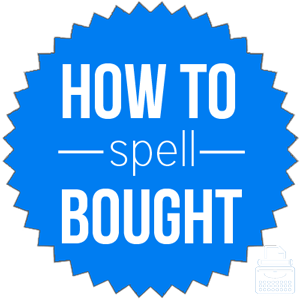 Spelling of bought: bought is spelled b-o-u-g-h-t. Definition of bought: Bought is the past participle of the verb buy, which means to acquire possession or rights to an object(s) or service(s) by payment. The word functions as a verb. Pronunciation of bought: bought is pronounced as bawt. It rhymes with thought. What does bought mean? The word bought is the past tense form of buy and is used when discussing the purchase of something that occurred in the past. I bought this dress last summer at the little shop downtown. Our friends recently bought property in that area, and we’re thinking of buying one of the lots ourselves. The word is also used as an adjective to modify nouns. Even though the cake was just a store-bought cake, it looked like a specialty cake. Not many phrases use the word bought, but there are at least two in which it is used if describing or talking about the past. Buy / Bought into: when one purchases interest, shares in, or a portion of something. Buy / Bought out: To purchase the entire stock, rights, interests of something. Bought the Farm: Euphemism for death. According to Merriam Webster’s, bought is the past participle of buy, which was first used in 1796. The verb buy comes from Middle English bien, beyen from the Old English word bycgan; byg- is related to the Gothic word bugjan. The word bought can be used as both a verb and an adjective and in a few different senses, thus it’s important to use the right synonym for the given context. Bought is the past participle of the verb buy. In most cases, it functions as a verb, but it can also be used as an adjective to modify nouns.